Now supporting Open File Backups! Backup your data and applications on any internet-connected server, and securely store files according to customized retention policies. Data is the lifeblood of any organization - and keeping that data safely backed up and accessible in the event of file corruption is crucial. Obendrein haben Organisationen unterschiedliche Datenaufbewahrungsrichtlinien, die bestimmen, wie lange die unterschiedlichen Informationstypen gesichert werden und wo sie physikalisch gehostet werden sollten. For any server connected to the internet, Simple Backup Service offers the ultimate in reliability and convenience. 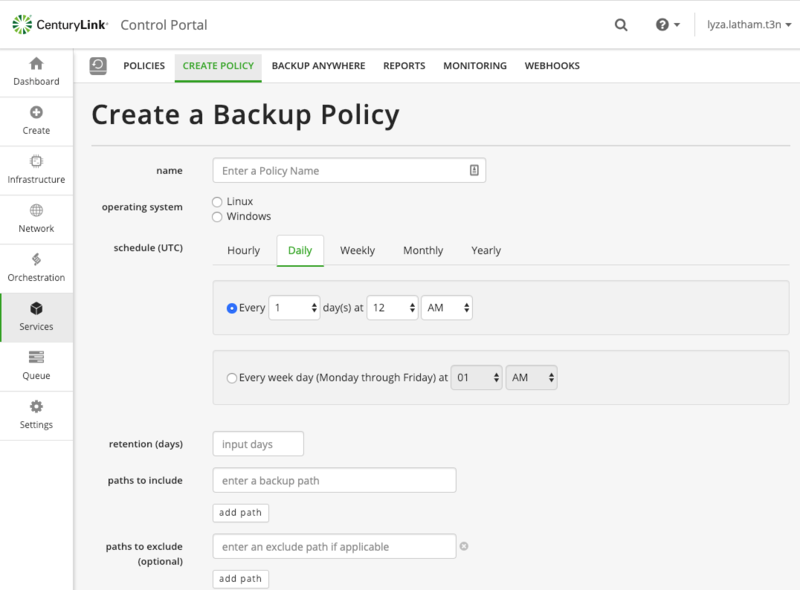 Just point-and-click to create backup policies that meet your requirements, then apply them to servers in the CenturyLink Cloud. Simple Backup Service supports VSS snapshots on Windows servers to ensure safe backup of open files. From there, Simple Backup Service does the rest for you — data is automatically backed up in secure object storage and retained according to the policy. What’s more, you can access Reports from the Control Portal or the Public APIs that provide details about backup and restore activity. In addition, the Simple Backup Service Monitoring feature keeps you informed of backup status with email alert and webhook notifications. Restores are simple too — just define the data you want to restore and the server to restore it to, click the Restore button, and it’s done. 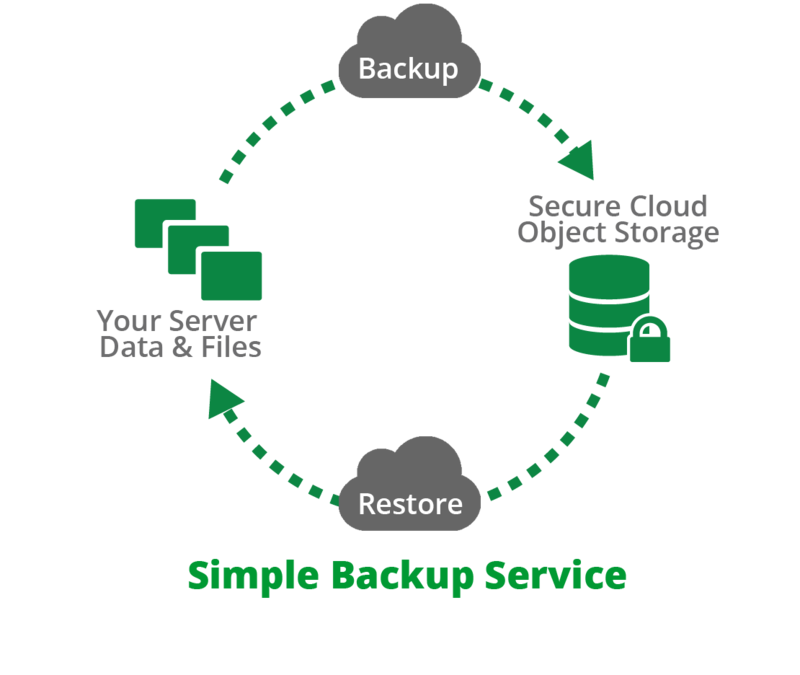 Simple Backup Service operations are completely automated. Die Daten werden von Ihrem Server via Internet zum sicheren Object Storage übertragen. Die Backups werden so lange gespeichert, wie Sie festgelegt haben. Restores are simple — just select the point-in-time backup you want to restore from, click and it’s done. Restores are simple — just select the point-in-time backup you want to restore, the server you want to restore to, click the Restore button, and it’s done. Erstellen Sie und benutzen Sie Datenaufbewahrungsrichtlinien, die den gemeinsamen Unternehmensrichtlinien entsprechen. Customize every aspect of your data backups — including location, backup schedule, and retention period. Supports data sovereignty, with backup sites in the US, Canada*, the EU and APAC. Store data for as long as required — days, month, or years. Der Einfache Backup-Service ist mit dem Control Portal integriert und verfügt über einen Zugang im API. 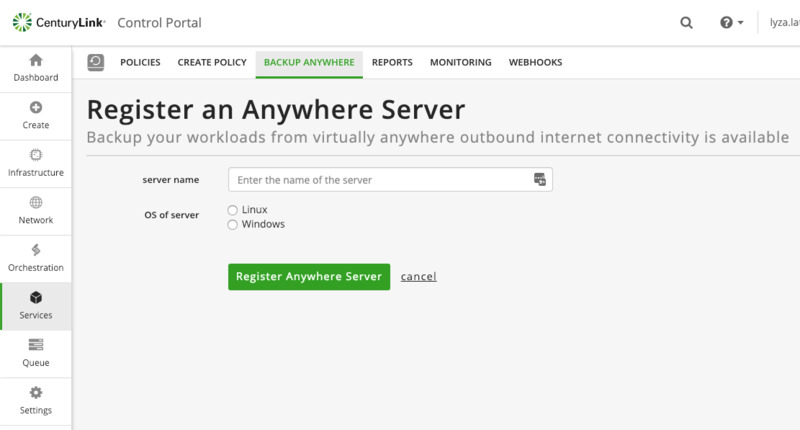 Supports virtual machines, Bare Metal and cloud servers on the CenturyLink Cloud Platform. Point-and-click to install the backup agent - no need to SSH or RDP to get started. 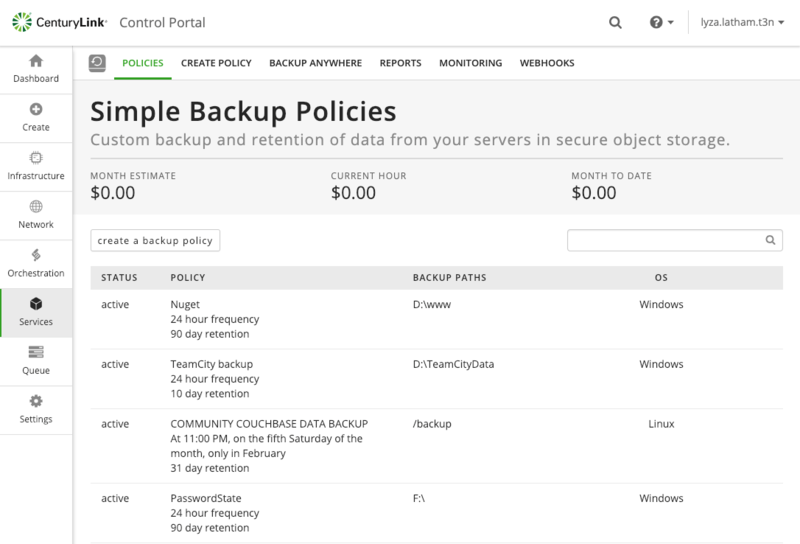 For servers located anywhere else, download the client and configure backups from the CenturyLink Control Portal. Keep backups efficient, by specifying only the file paths you need to be backed up. Sie können auch die Ordner konfigurieren, die vom Backup ausgeschlossen werden sollen. Reporting features to help you analyze backup and restore job information including date and time query capability. Peace of mind with up-to-the-minute alerts. Proactive notifications for failed and/or successful backups and nightly summary status. Configure and receive email alerts in the Control Portal. * The Canada region does not currently support encryption. ** JSON-formatted webhook notification compatibility required. Start backing up server data immediately to secure cloud object storage. Simply apply a policy to the server, then install the Simple Backup Service agent. Your data will be backed up at regular intervals automatically. No matter your requirement — days, weeks, months or even years — Simple Backup Service will keep your data safe and secure for the duration you specify. Backup as much or as little data as you like - Simple Backup Service only charges for the storage you use. Und damit die Kosten niedrig bleiben, behandelt die Backup-Operation nur die Daten, die seit dem letzten Backup verändert wurden. Data sovereignty matters - so Simple Backup Service keeps your data in-region, wherever that may be. Host backups in CenturyLink's world-class data centers around the globe. Simple Backup Service support for Volume Shadow Storage/copy (VSS) snapshots means that users can backup open files while preserving file consistency for VSS-supported applications and databases running on Windows servers. Access powerful Monitoring and Reporting features via the Control Portal. 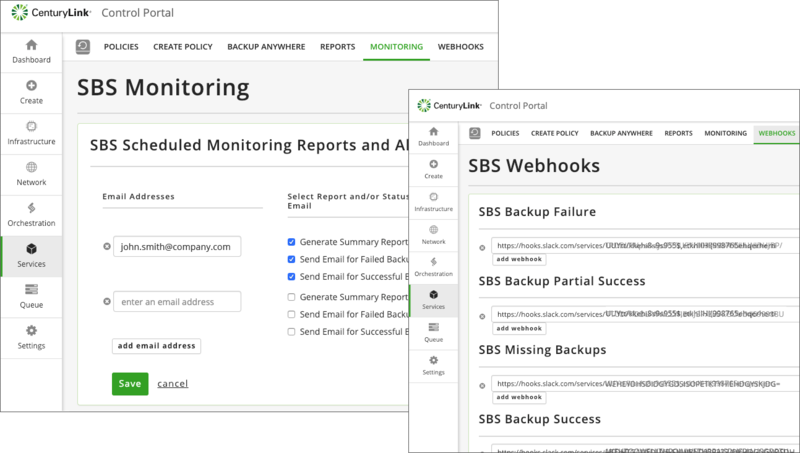 The SBS summary report provides an overview of all your servers while the Monitoring features keep you apprised of backup job status with email or webhook notifications. Data loss can result from numerous threats and it's only a matter of time before it happens. The key is to be prepared. Simple Backup Service can protect your data - on any internet-connected server - and provide peace of mind. Data type and compliance considerations often dictate retention requirements. With Simple Backup Service, extensive configurability allows you to keep your data for as long or as short a duration you specify. Storage location is also important when it comes to backups, whether it's due to data sovereignty laws, geo-redundancy needs, or speed of backups. Combined with CenturyLink Cloud's global footprint, Simple Backup Service provides the flexibility to meet your data location requirements. A scalable and affordable backup solution is a must for any business focusing on growth. Simple Backup Service offers advanced API integration at a competitive price, and the solution offers easy ways to minimize restore costs using selective file restore, so your business can maximize its budget. Schützen Sie Ihre Unternehmensdaten mit sicheren Backups auf Dateiebene in der Cloud. Data that is restored from backup. Speichern und verwalten Sie Ihre großen Cloud-Anwendungen in einer hochskalierbaren, fehlertoleranten, verteilten Datenbank. Günstiger Schutz für Ihre Daten am Standort und Produktions-VM. Mit SafeHaven für CenturyLink Cloud vermeiden Sie die enormen Kosten, die durch IT-Ausfallzeiten und Datenverlust entstehen.